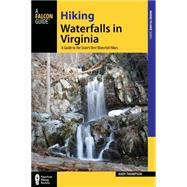 Hiking Waterfalls in Virginia includes detailed hike descriptions, maps, and color photos for approximately 100 of the most scenic waterfall hikes in the area. Hike descriptions also include history, local trivia, and GPS coordinates. Hiking Waterfalls in Virginia will take you through state and national parks, forests, monuments and wilderness areas, and from popular city parks to the most remote and secluded corners of the area to view the most spectacular waterfalls.